- For group bookings (over 15 people) we require a 30 day notice to process cancellation. - Deposits will not be refundable for cancellations with less than 30 days notice. - The group may have to be split-up with the Property Next Door depending on availability, group size and configuration of bedrooms. - We require a 50% deposit. Se você está procurando o melhor serviço, conforto e o melhor paisagem, nossa Pousada é o seu lugar. 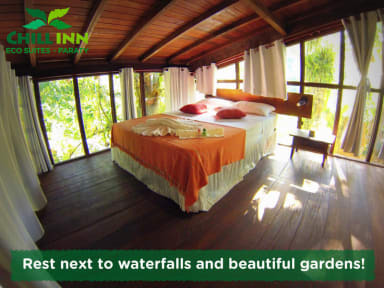 Em Chill Inn Eco-Suites, os amantes da natureza, podram relaxar e desfrutar da Mata Atlántica na Serra da Bocaina. Hospede-se neste pedaço de paraiso e descubra porque amamos tanto este lugar. Muito bom lugar para quem gosta de contato com a natureza! 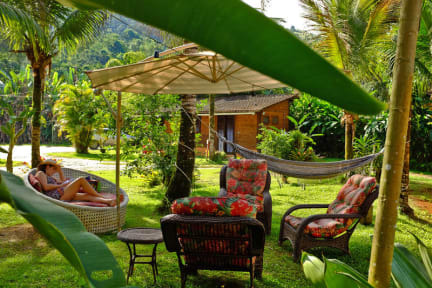 The place is about 5 km from Paraty, so I suggest you have a car to get here. The rooms are around a lovely garden, there is a central building where you have breakfast (excellent) and there is the staff desk. Daniela was really caring and helpful and made our staying really lovely. Close to the place there's a river with a natural pool. The context is lovely as you're inside the forest, everything looks very well kept and maintained. It's a top relaxing place for a romantic weekend or holiday.